Check Karuvoolam ECS Status Payroll For Pensioners? HomeHow toCheck Karuvoolam ECS Status Payroll For Pensioners? 3 Steps to Check Karuvoolam ECS Status For Pensioners | www karuvoolam ecs epayroll | epayroll tn gov in epayslip? Are you a Government Employee Looking for how much amount will be deducted in your salary account? In this article we will explain to you how to check ec in tamil nadu? The Department of Treasuries and Accounts have dedicated portal to find out the exact amount which will be treasuries account. Government treasury service only for government employee. The ECS is sense Electronic Clearling System for the purpose provision for currently working State Government Employees and also Ex Government Employees (Pensioners). Using this ECS portal Employees can easily check their Ecs Online Status. Follow the instructions below to get information on the Internet by submitting a list of payments on any day after the payroll list is submitted to the Treasury, the date on which the salary will be paid. Through this tnepayroll system you check ecs status for pensioners, pension payment slip , ddo bill status and more. 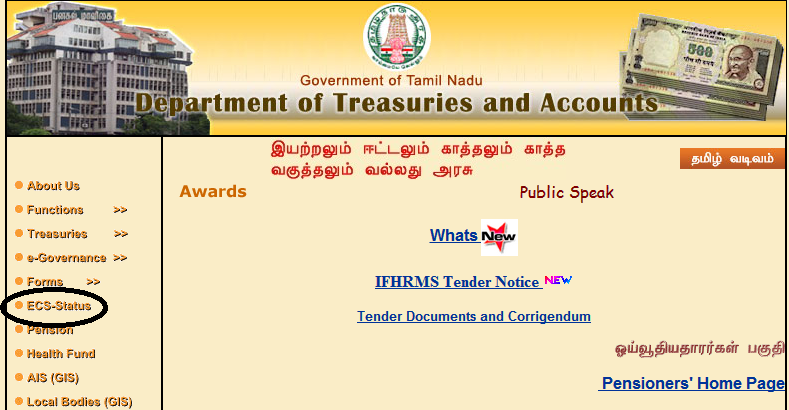 Go to http://www.tn.gov.in/karuvoolam/ and click ECS STATUS. - Click here: ECS Status Of Government Employee. - Then click Detailed Report By Bank Details. - After. Select your district. - Select the sub treasury. - Enter your bank's MICR code at BRANCH NAME. - You can visit MICR code at http://banksifsccode.com/. - Account No. Register your bank account number. - On the date of submission of the wage bill in the Treasury, we will be aware of the date.